With equity indexes settling the month on a moderately positive note, the VIX cooled a little, settling -3.1% @ 18.26 (intra low 17.49), although with a notable new cycle high of 19.80. Near term outlook is uncertain, with threat of 16.00/15.50s.. before a break into the low 20s. Suffice to add... a bit of a consolidation day for the VIX, with a notable new cycle high. A break (if briefly) into the low 20s still looks due... not least if the market wants to properly test the 200dma.. which will be around 2054 Wed/Thursday. US equity indexes closed moderately higher, sp +5pts @ 2063 (intra high 2074). The two leaders - Trans/R2K, settled higher by 0.1% and 0.6% respectively. 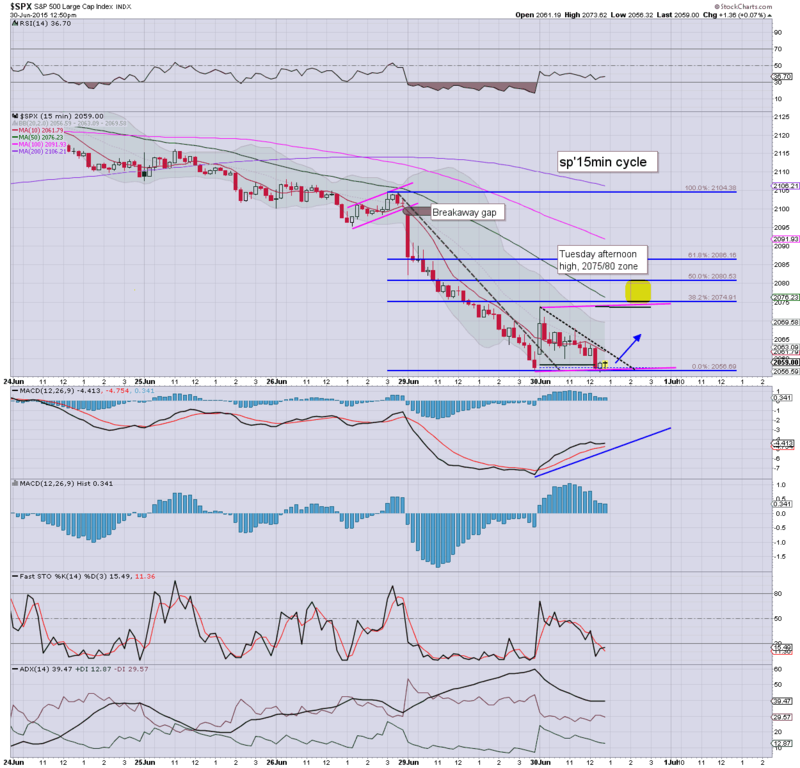 Near term outlook is uncertain, with hourly cycles threatening further upside, against broader downside. *closing hour was a bit of a mess... but then there was some end month issues. 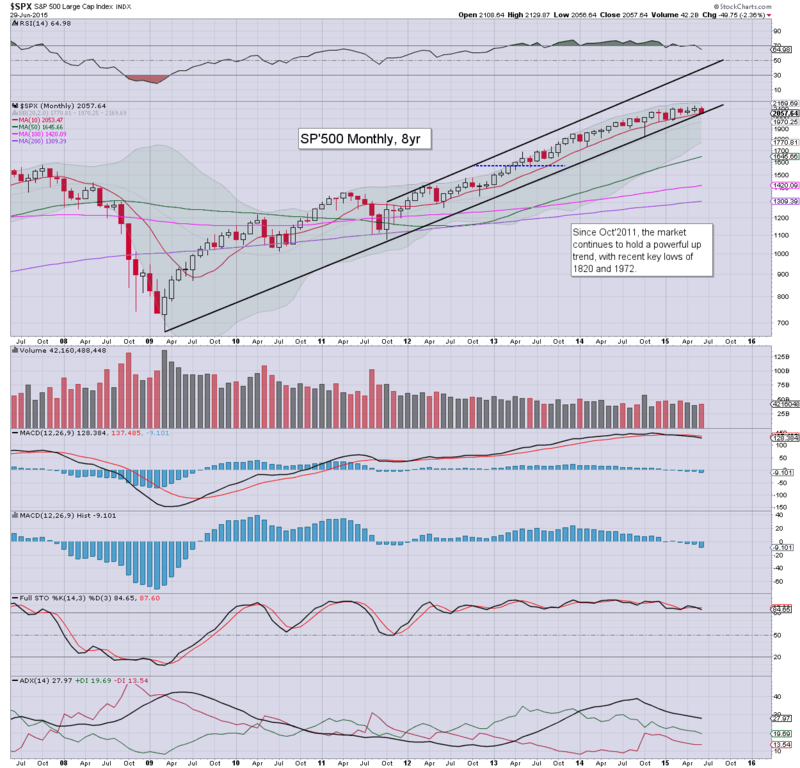 Broadly... all the main US indexes saw net monthly declines. The issue now is whether we'll see one further wave higher across July/early August.. and then some kind of brief.. but severe washout in Sept/Oct. *I remain on the sidelines overnight.. seeking an index short... once the hourly VIX cycle is better reset... preferably VIX 16/15.50 zone. 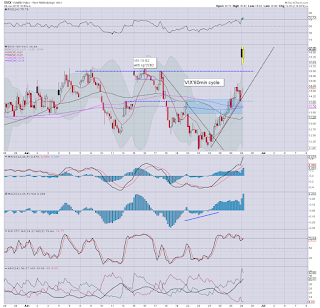 Effectively.. target was reached on a secondary bullish wave into the 2pm hour as expected. What I find a problem is the hourly VIX cycle... which is more suggestive that a market short from the 16/15.50 zone is viable tomorrow... or even Thursday (monthly jobs data). For now... I'm sitting back. Call it overly cautious, but I just ain't in the mood to get nailed on further upside tomorrow. I'd still expect some of the rats to sell into the close.. ahead of the Greek default this night. 3.15pm.. sp'2063... its not looking so pretty... the real issue is whether 2050 fails tomorrow... then we might actually see some mild panic. 3.29pm.. sp'2062.... the rats are getting twitchy.... ahead of the overnight default. Naturally.. yours truly is not short.... but at least I'm not long. oh well. 3.46pm.. sp'2065.... its getting increasingly choppy. *I remain on the sidelines... yours... Mr Cautious. Okay.. I'm back from a walk (if only to get some sun on my face).. and I see renewed upside. Typical turn time is 2.30pm.. but based on the earlier wave.. maybe we'll max out a little later around 3pm. I will be VERY tempted to launch an index short before the close.. not least as price action remains very shaky. 2.09pm.. sp'2072... okay.. we're getting real close to target zone. 2.14pm.. short-stop cascade in progress. 2.20pm.. Reviewing the VIX hourly chart... its a problem for those wanting to short this afternoon. I'd sure feel a lot better going short with VIX 16/15s. 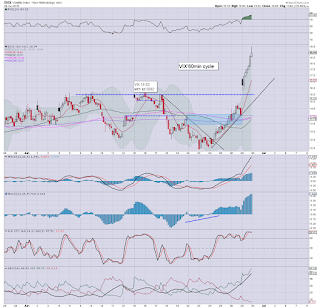 2.30pm... Well, its typical turn time... we're seeing a reaction from a fractional new high of sp'2074. As things are... I am not liking the bigger hourly equity/VIX cycles which threaten another stupid move higher tomorrow morning. For the moment, I am merely watching. 2.36pm.. I am trying to keep in mind we have the monthly jobs data on Thursday... that will be a wild card that could go against the bears. 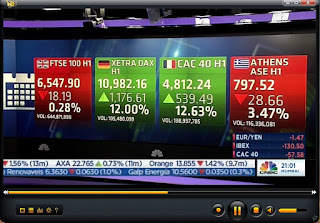 US equities have already turned fractionally negative, as more traders are starting to realise there will be no Greek deal, nor a payment to the IMF today. 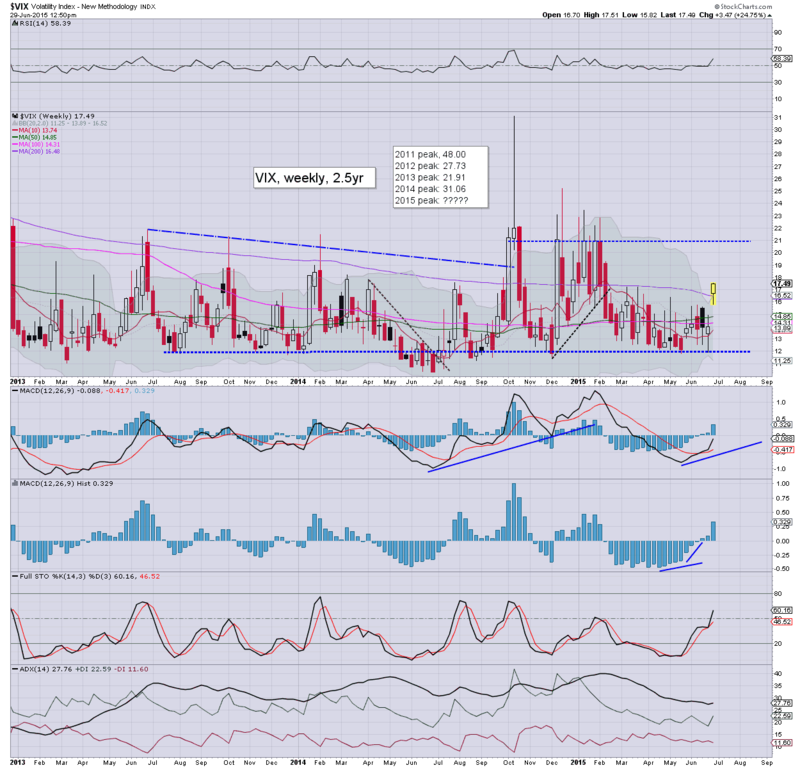 VIX has confirmed the equity weakness, with a new cycle high of 19.79. 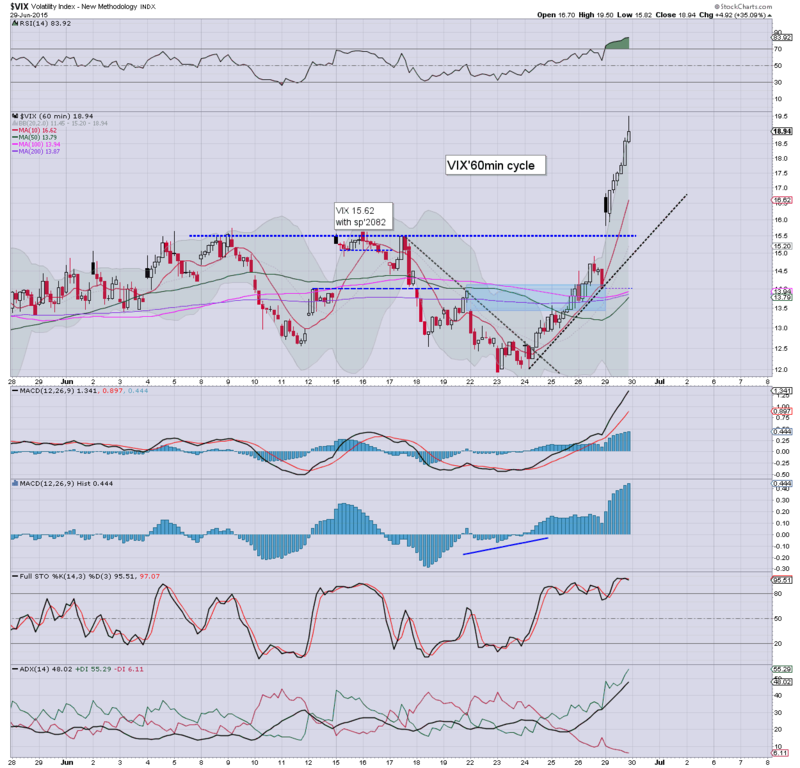 USD is building gains, +0.7% in the DXY 95.40s. Suffice to say... I am not chasing things lower from these levels. 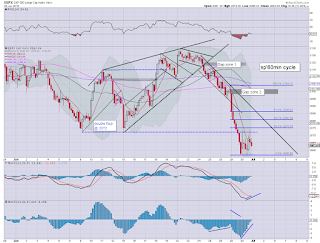 I want at least the sp'2075/80 zone. Of course, that might simply not occur.. if so.. I'll miss out. 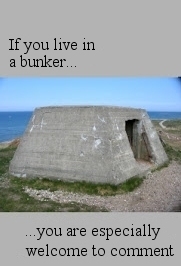 I can live with that. 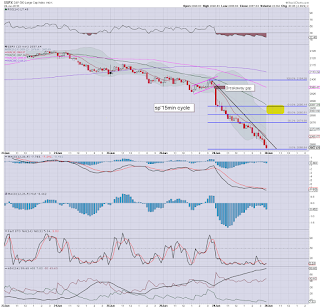 There is arguably a double floor of sp'2056.. but broadly... price action sure doesn't look great right now. US equity indexes continue to appear to be building another bear flag.. before renewed downside across Wed/Thursday. 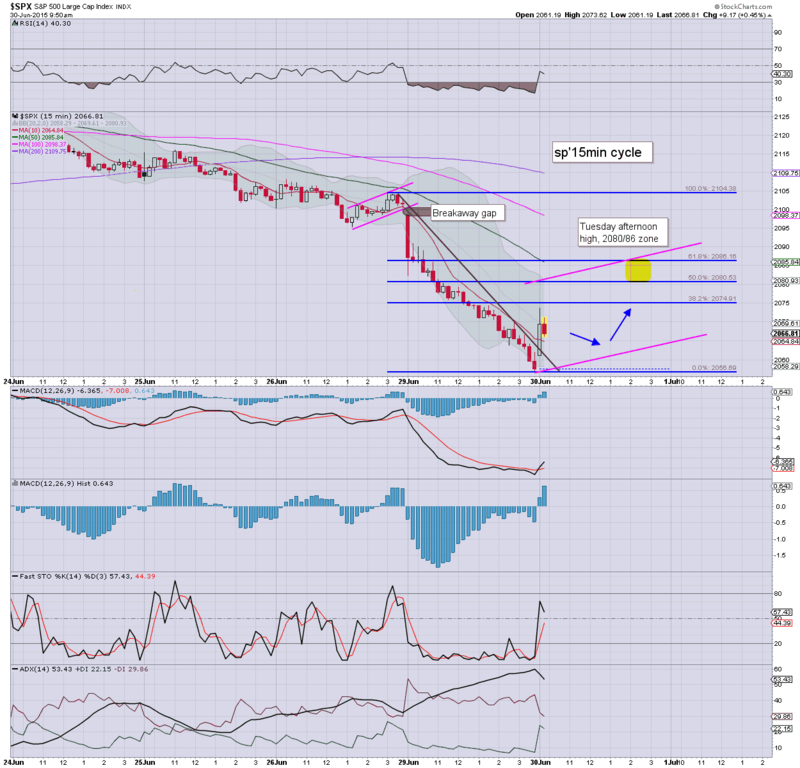 An afternoon peak in the sp'2075/80 zone - with VIX 17/16s, looks on track. The real issue is whether the 2050s will fail to hold in the next wave.. if so... there is empty air to the giant 2K threshold. Market probably wants a few more hours in the current up cycle. I will be seeking at least some degree of closing hour weakness... ahead of the IMF payment deadline.. which will be missed. From EU-CNBC...indexes, first half net changes..
12.29pm.. Well, the morning low is about to be taken out... indexes turning red. Hmm... as things are.. I'm certainly not chasing it lower from these levels. 12.38pm.. VIX 19.72... seems like forever since we've seen the 20s. If by some miracle we still see another afternoon ramp on more 'last minute' Greek hope... overall price action is clearly still very weak. US equities are battling to hold minor gains. 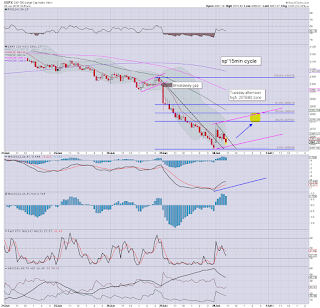 Further upside looks due into the afternoon, with a more realistic upside target zone of sp'2075/80. The Monday low of 2056 looks set to be broken before the Thursday/weekly close.. as traders will face extreme uncertainty with the Greek referendum this Sunday. 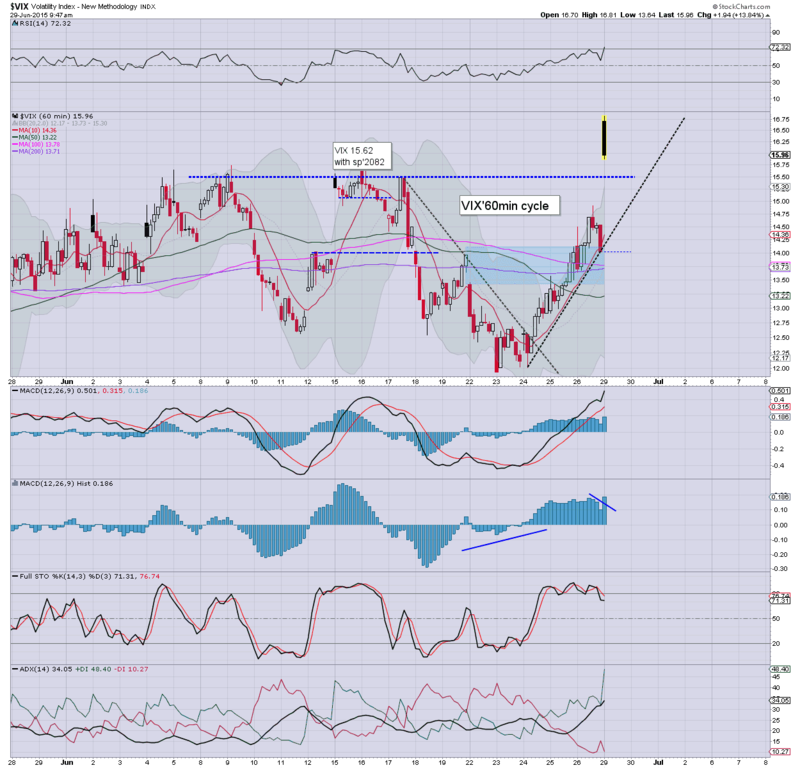 Yes, I've lowered the upside target a little for this afternoon... after the market got stuck at 2073.
notable weakness: metals, Gold -$8, which will make for a net monthly decline of around $20. *I am on the sidelines... and will strongly consider a market short this afternoon.. if price structure looks bearish enough. 11.19am... sp +9pts @ 2067.... upside into 2pm..... 2075/80... on track. US equities open moderately higher into the sp'2070s, with the VIX naturally cooling into the 17s. 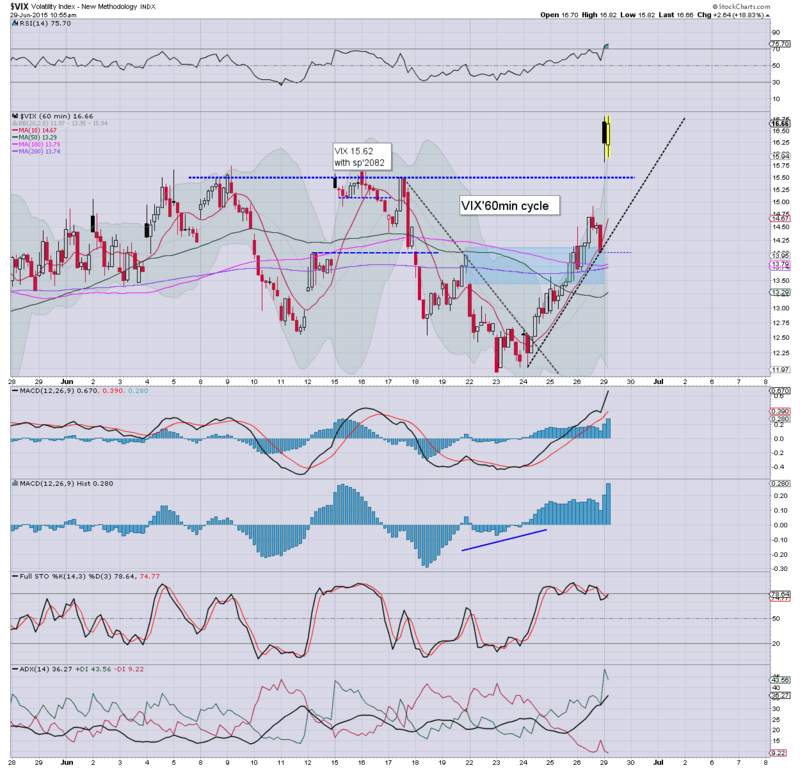 USD is holding minor gains of 0.3% in the DXY 95.00s. 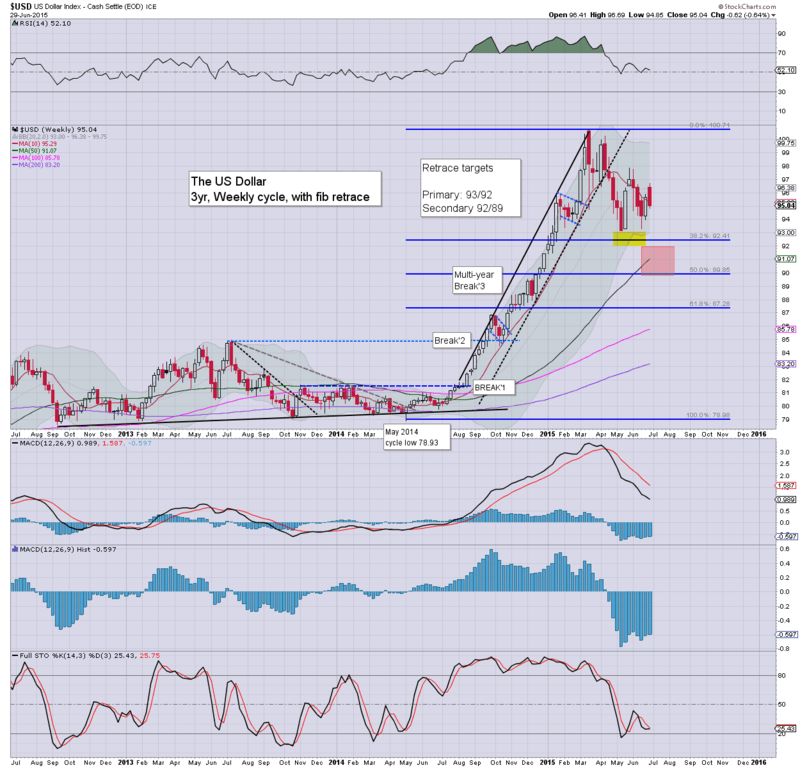 Metals are increasingly weak into month end.. Gold -$9. Oil is building sig' gains of 1.2%. 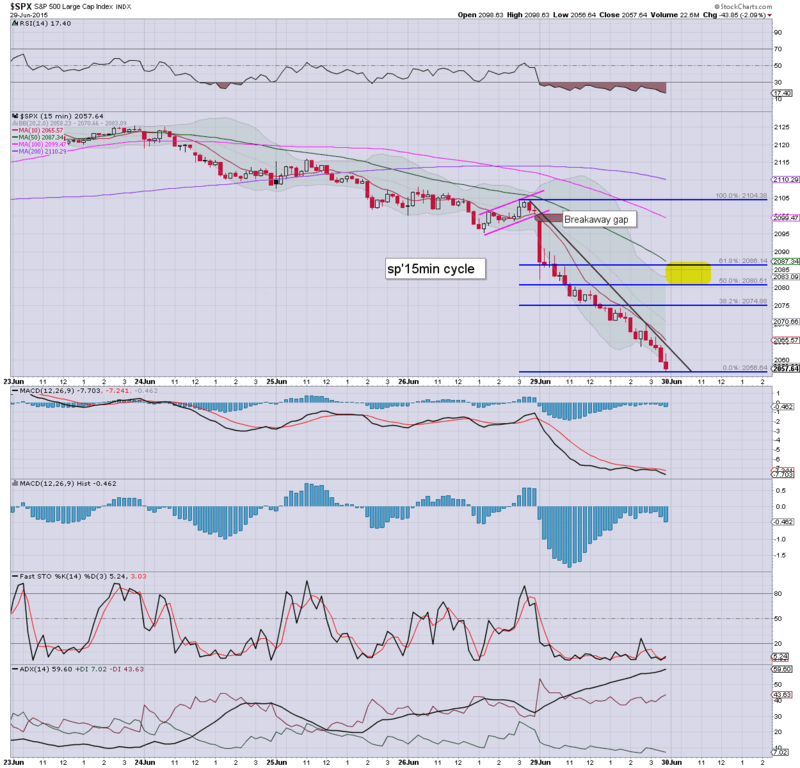 Best guess... a net daily gain.. with price structure being a bear flag by late afternoon.. somewhere in the sp'2080s. Closing hour should see renewed weakness... ahead of the official Greek default/failure to pay the IMF. 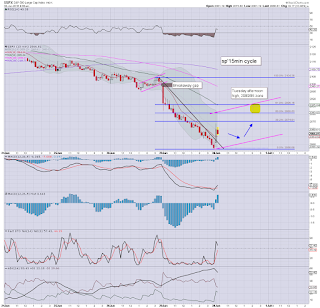 A daily close >2085 would seem highly unlikely before a test of the 200dma.. currently @ 2053. Best case for the bears... further downside into early next week, with a washout to around the 2K threshold... along with VIX spiking into the 23/25 zone. 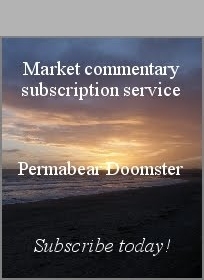 *I am on the sidelines, will consider a market short.. later this afternoon... if price structure is bearish. 10.01am consumer confidence: 101.4 vs 95.4 prior. 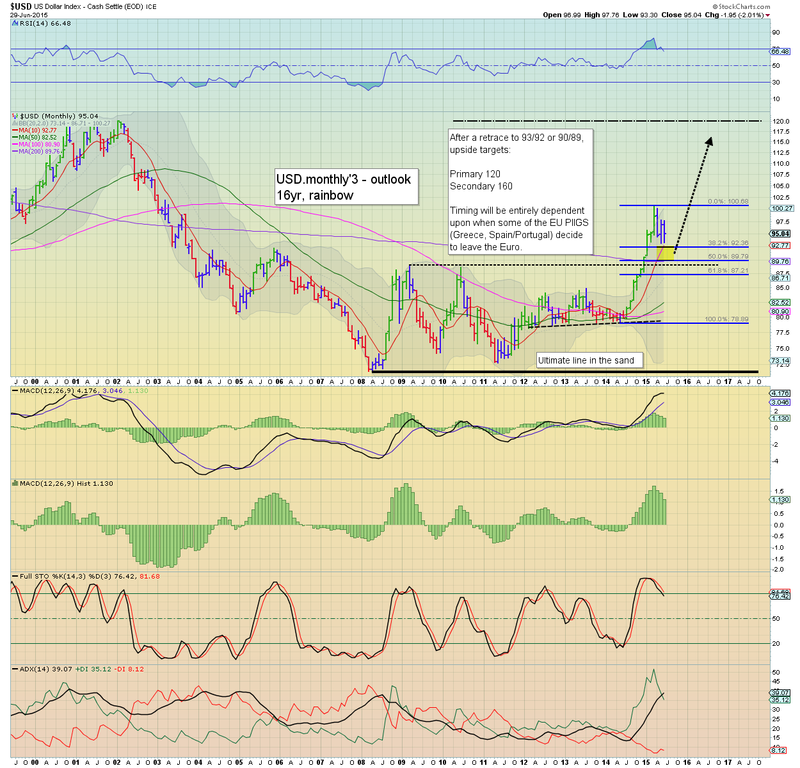 a powerfully bullish number... something for the bull maniacs to tout. 10.25am.. minor chop... still... another wave higher into the afternoon looks very probable. Notable strength in the VIX.. as its back to almost evens. 10.38am... remaining choppy... Mr Market will surely want to kick out more bears later today.. before the downward trend resumes. notable weakness: BTU -13%.... coal miners are seeing some increasingly wild action lately. Good morning. Futures are moderately higher, sp +11pts, we're set to open at 2068. Greek finance minister Varoufakis has confirmed the payment to the IMF will not be made today. USD is bouncing, +0.5% in the DXY 95.20s. Metals are weak, Gold -$6. Oil is +0.8% in the $58s. 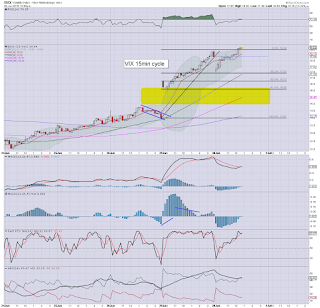 *I highlight the monthly chart.. since it is of course the last day of June. ALL equity indexes are set for net monthly declines... and we're seemingly in the early phase of a summer/early autumn correction. 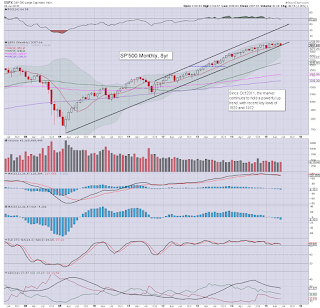 If we keep falling to sp'2K in the days ahead, it will make the notion of new highs into early August.. rather unlikely. 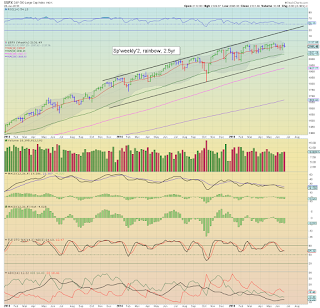 More on the monthly closes... after the close of today. Well, I'm increasingly thinking we'll see a full washout to the giant 2K threshold. If price structure across today is a baby bear flag... I'll strongly consider launching an index short and/or VIX long. There is probably no hurry on such a trade... prime time would be around 2.30pm. Overnight action in China... another wacky night... with the Shanghai comp' swinging from -5% to settle +5.5% @ 4277. Pure crazy. There is a fair bit of chatter on whether the Chinese central bank were bidding up stocks... impossible to know of course... but what is clear... the volatility remains extreme. I still think the 3400s are the most valid... and natural target this summer. Seeking a bear flag to develop today.. maxing out in the 2080/85 zone or so. In theory.. any short form 2080s should offer around 30pts of downside to test the 200dma of 2053. Broadly. thats a lousy number... STILL suggestive of Q2 marginal recession. 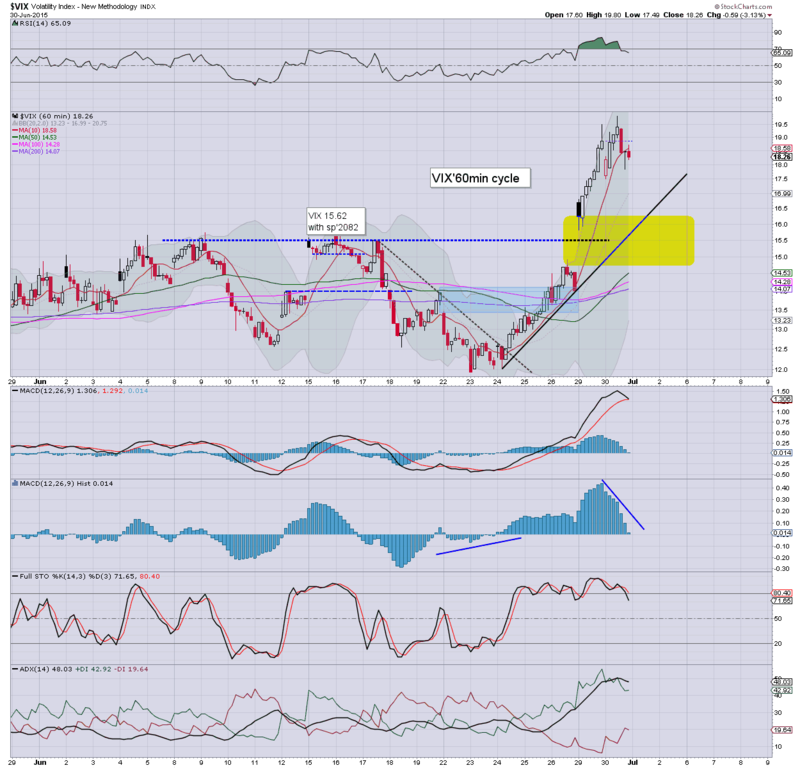 Sunday night saw the USD break into the DXY 96s, but with widely acknowledged intervention from a number of central banks, the Euro was bought... cooling the USD (intra high 96.69), settling -0.6% @ DXY 95.04. 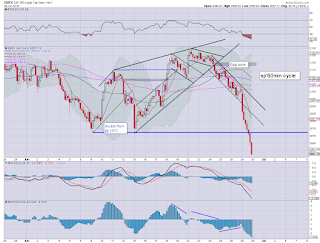 The secondary bearish target zone of 92/90 remains on track. Suffice to say... even the cheerleaders on clown finance TV were able to acknowledge the overt intervention by various central banks across Sunday night and throughout Monday, in an attempt to stabilise currency markets.. and indirectly negate some of the equity weakness. Clearly, the intervention worked to some extent.. but its not the sort of thing that can be done every day, right? 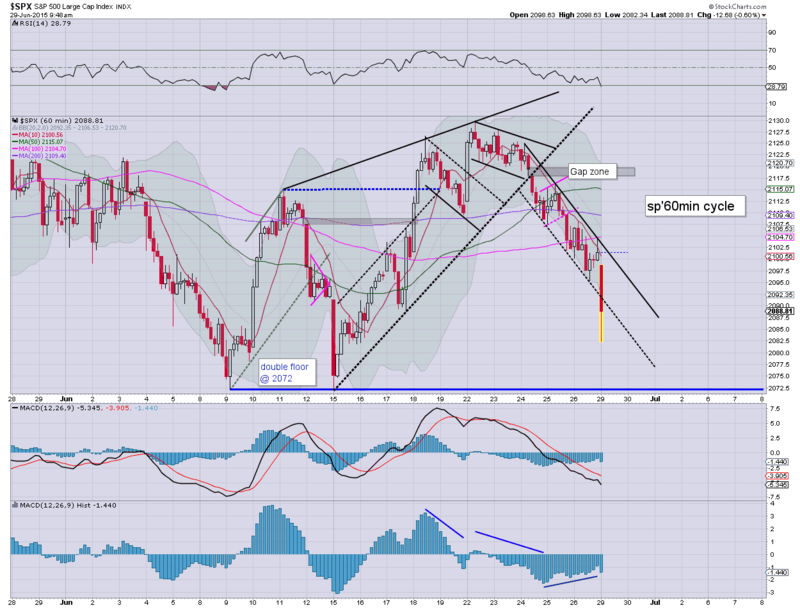 Well, regardless... the fact the USD actually closed net lower will have surprised many. It is taking long than I had expected, but the 92/90 zone is still viable.. before the hyper-ramp into the DXY 120s. A net Monday decline of -3.3% @ 4053... with an intra low of 3875. The 3400s are well within range in the near term. Tuesday will see Case-Shiller HPI, Chicago PMI, and consumer conf;'. *Fed official Bullard will be speaking.. and Mr Market will no doubt be listening. US equities closed significantly lower, sp -43pts @ 2057. The two leaders - Trans/R2K, settled lower by -2.0% and -2.6% respectively. Near term outlook remains bearish, with next support in the 2060/50 zone, where there are multiple aspects of support. 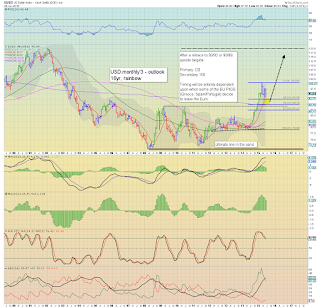 Any failure of 2050... opens a fast move to the giant 2K threshold. 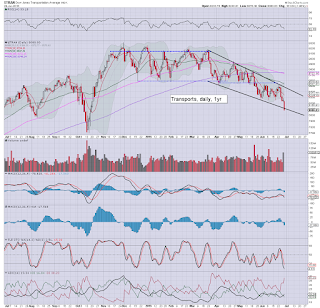 *notable weakness in the 'old leader' - Transports... seemingly set to floor at either the psy' level of 8K... or a more severe 7700 - the Oct' low. It could be argued.. if 7700 is hit in the current wave.. there is a viable bearish H/S formation into the early autumn. A pretty rough day for the US equity market.. opening lower, a minor morning bounce, but then further downside across the afternoon. 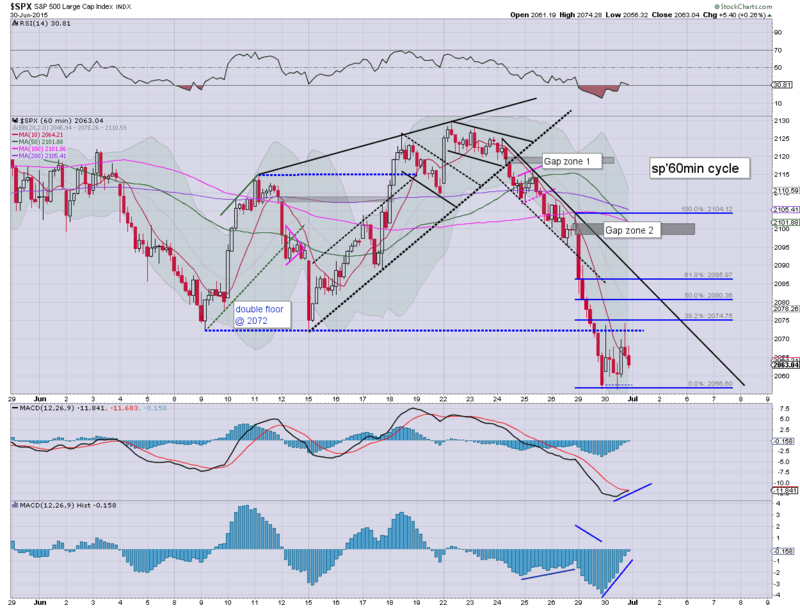 There are numerous aspects of support in the sp'2060/50 zone... and considering a number of uncertain Greek hurdles yet to break through, we might even see a brief washout to the giant 2K level... along with VIX in the low 20s. 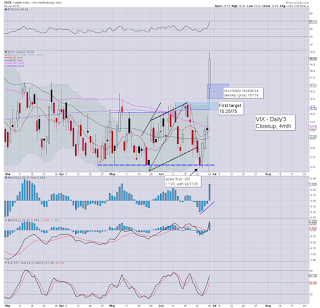 With world capital markets riled by the ongoing Greek crisis, the VIX opened sharply higher, and built powerful gains across the day, settling +35.1% @ 18.94. 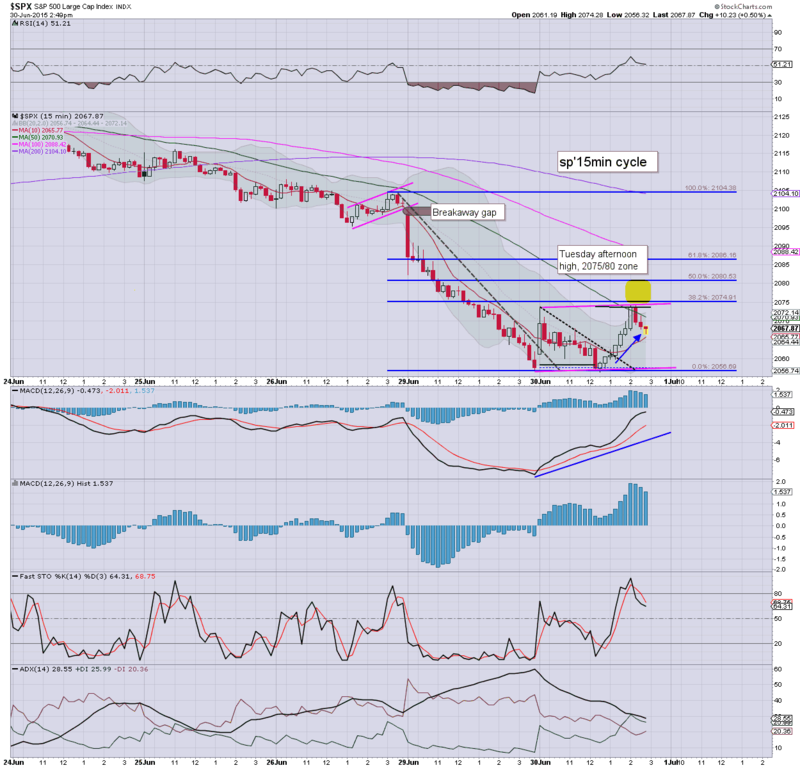 Near term outlook offers further equity weakness, with next resistance in the 20/21 zone. *closing hour saw further equity weakness, helping VIX break into the 19s, for the first time since February. The bigger VIX weekly cycle has been warning of a break higher since mid May. Today's sustained action >17, has opened the door into the low 20s. As ever though, it will be difficult for the VIX to hold above the key 20 threshold for more than a few days. 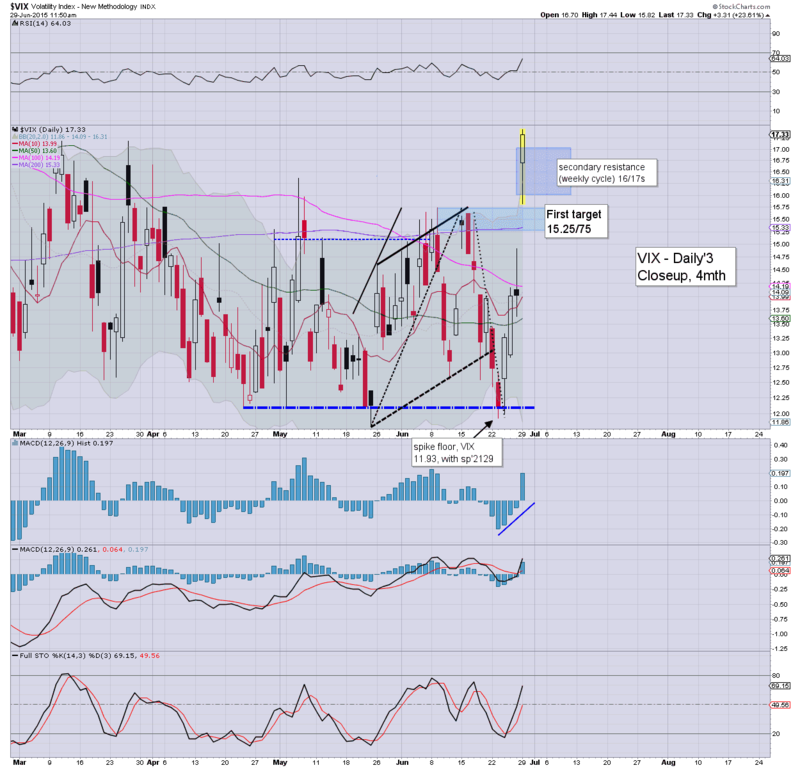 More significant VIX upside looks due in the late Aug/Oct' time frame. 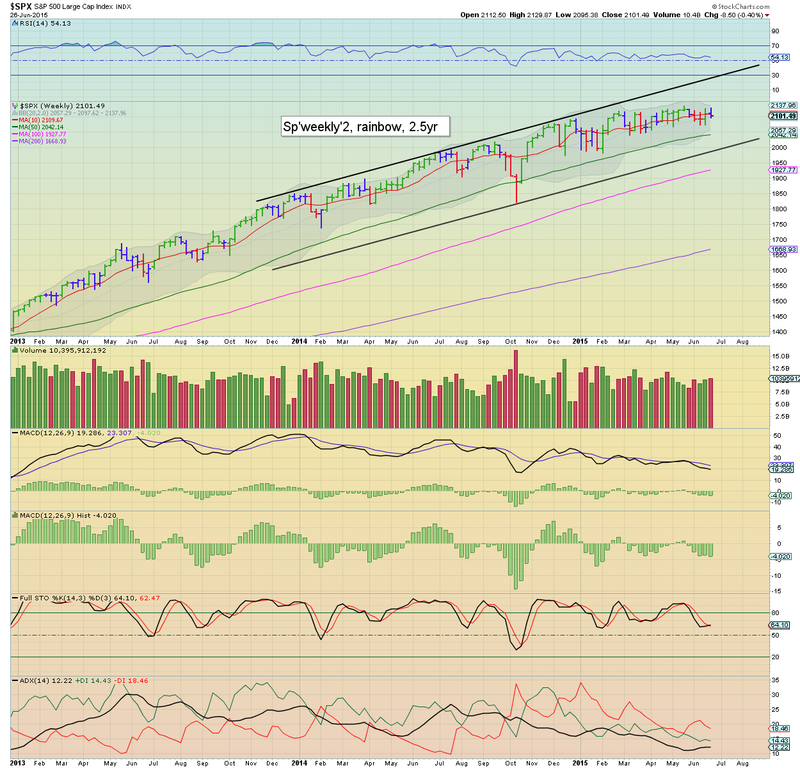 A move into the 30s looks just about viable... if sp' sees a sig' correction <2K. *I exited a long VIX position this morning, will be looking to get involved again in the VIX in August.. and across September. .. to those short the broader market.. congrats... it has been a long time coming. Of course... this down cycle will likely end within the next 3-4 trading days. I'm still looking for the real action in the Aug-Oct' time frame. 3pm update - what is best in life? 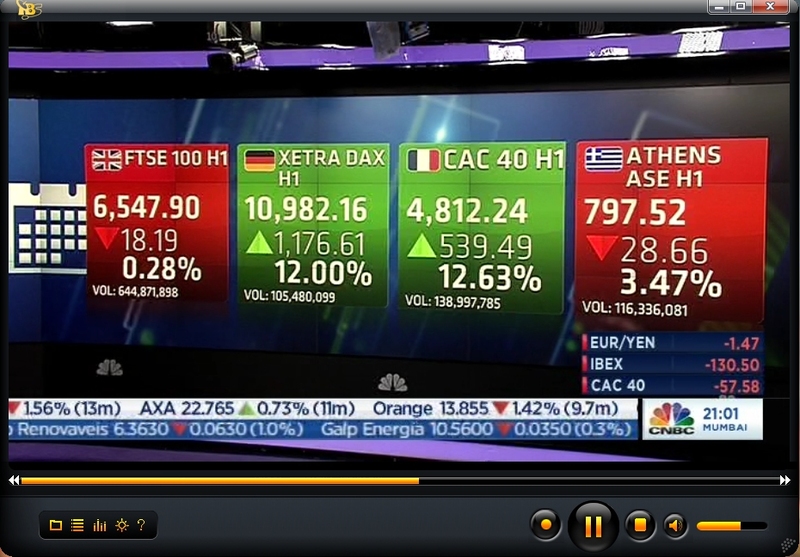 The sp'500 -32pts @ 2069 (intra low 2063), the VIX +29% in the 18.20s, and the lamentations of the cheerleaders on clown finance TV, who are finally starting to realise Greece does not have any money to pay the IMF tomorrow. Yes.. those are indeed three of the best things in life... at least for today! *again, a reminder of the bigger VIX weekly cycle.. which shows next resistance is not until the 20/21 zone.. having taken out the 17s this morning. Well, an interesting start to a short 4 day week. Regardless of the exact close... a clear victory for the equity bears. No doubt... a time to go long is coming sometime soon... but for now... I'm content to watch and see how low we might go in the near term. 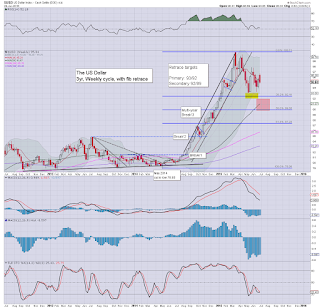 notable weakness: USD -0.7% in the DXY 94.80s... as the central banks 'meddle'. 3.12pm.. sp'2065... VIX almost in the 19s... the big 20 threshold will be viable at the Tuesday open.. not least if the sp' is testing the 200dma of 2053. That'd make for a natural bounce zone.. if only for a day or two. 3.18pm.. the overnight futures low of sp'2060 is about to be taken out... along with VIX 19s.... pretty impressive. Oil -2.3%... I will consider going long Oil across the next few days. 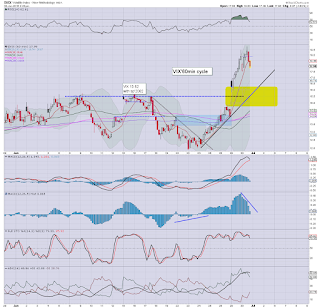 if only for a short term day trade, not least as the USD is set to cool to the DXY 92/90 zone. 3.29pm.. notable weakness , INTC -2.0% in the $30.40s... should floor around $29.00 in the current cycle. sp' -37pts @ 2064.. with VIX 19s hit. Here is something... market is now well within range for a straight gap under the 200dma of 2053 tomorrow morning.... and any break <2050... opens a 'fast ride' to 2K. US equities continue to slip, with the sp' breaking the double floor of 2072... with a new cycle low of 2070, with VIX +26% in the 17.70s. Near term outlook remains bearish, as the market will remain very vulnerable to sporadic 'spooky Greek' news. 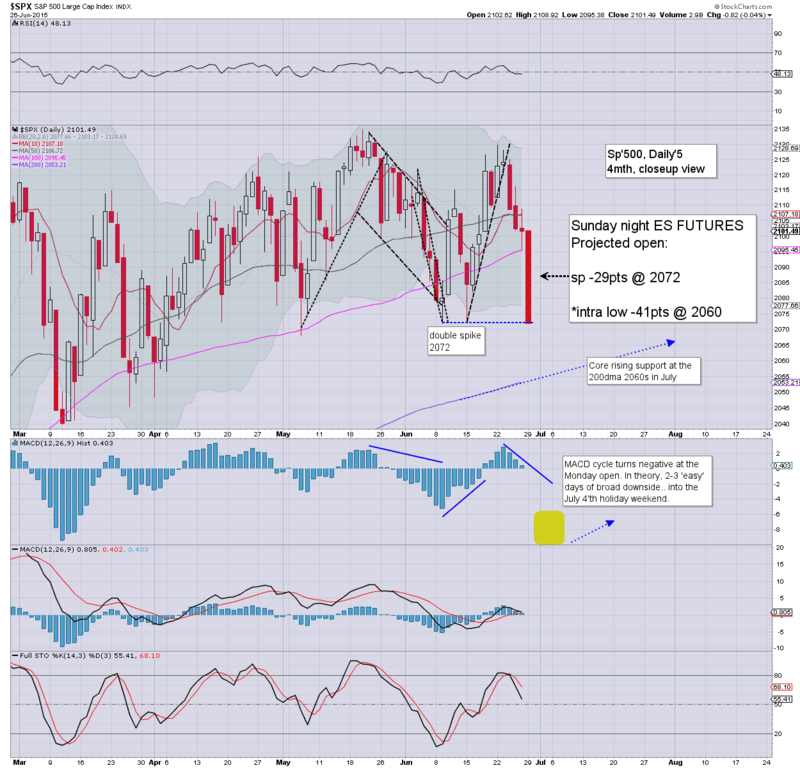 The overnight futures low of sp'2060 looks set to be tested.. whether into today's close.. or tomorrow. The real issue is whether the 200dma of 2053 will hold.. or if the market can see a more significant down wave to the giant 2K threshold. The latter will certainly not be easy.. but it is a valid target into early next week. 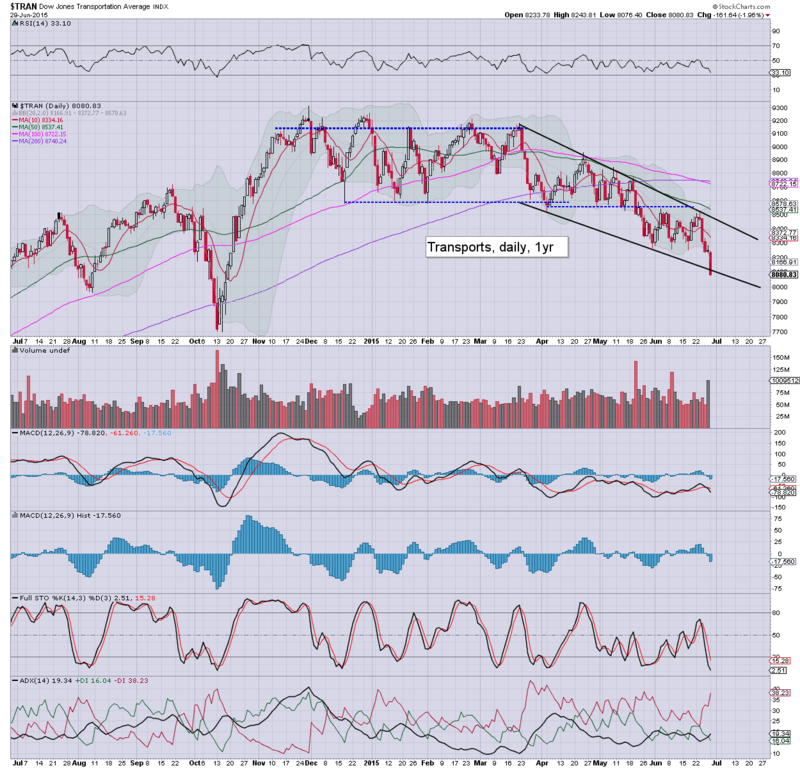 notable weakness: airlines, DAL -2.1%, UAL -2.7%.. as the transports continues to unravel. 2.14pm.. sp'2069.... VIX 17.94..... as noted earlier... next VIX resistance is not until the 20/21 zone... which would arguably equate to a test of the 200dma of sp'2053. notable weakness, USD, -0.6% @ DXY 94.90s.... as the Euro shorts are getting whacked via central bank intervention. 2.23pm.. no floor until at least 2060... ... with VIX open air to 20/21. Considering the market has a Greek 'missed IMF' payment due.. and the uncertainty of the referendum... things remain a real problem. notable weakness, Ford, -3.0%.. in the upper $14s. 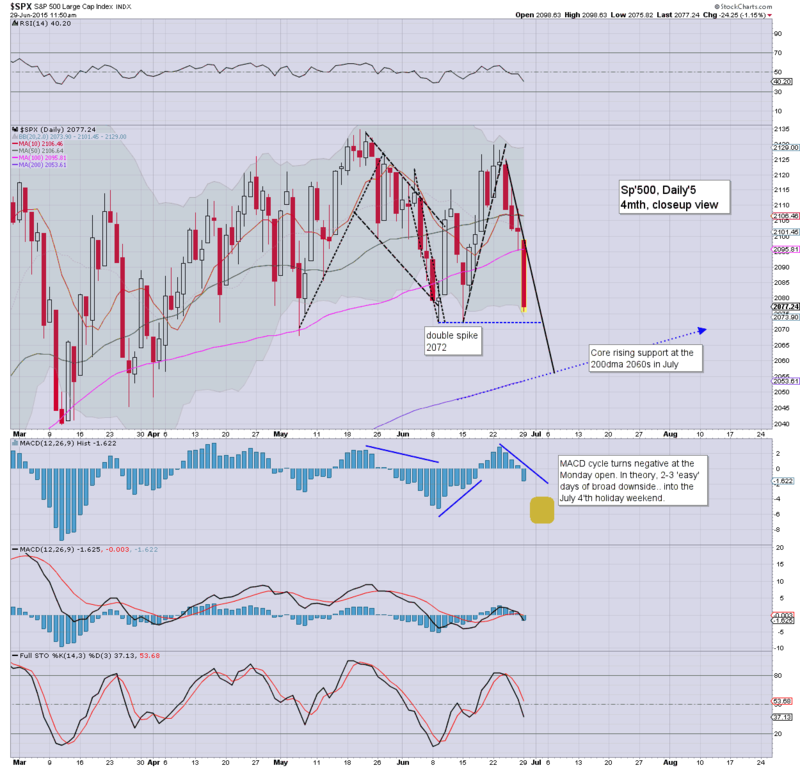 US equities are continuing to unravel, with the double floor of sp'2072 set to be broken. After that... the overnight futures low of 2060.. and then core support at the rising 200dma of 2053. Sustained action <2050 looks unlikely in the current cycle. *I highlight the VIX weekly.. since with the break >17... the next resistance is not until the 20/21 zone. Interesting day.. but all things considered, these are still not the degree of declines that some of the bears could have justifiably been seeking today. The market will remain under high pressure tomorrow and all the way into next week... there is such a high level of uncertainty in the immediate term. strength: TLT +1.9%... as bond yields naturally fall.. 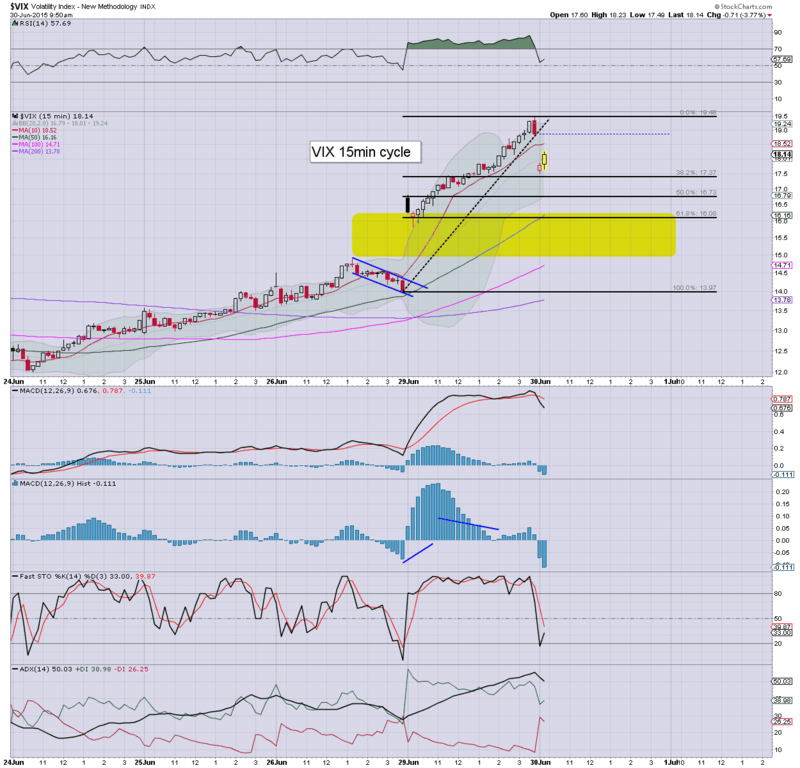 US equities see another wave lower, sp -24pts @ 2077, with VIX +23% in the 17.30s. 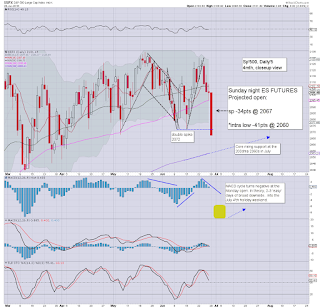 Next soft support is the double low of 2072, then the futures overnight low of 2060. Primary support is the 200dma.. currently @ 2053. USD continues to cool, -0.3% in the DXY 95.10s. *with the break above 17, the door is finally open to next resistance in the VIX 20/21 zone. 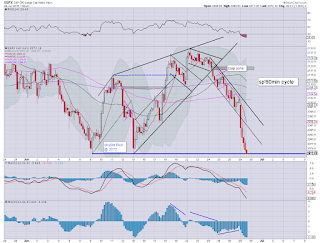 Considering the ongoing Greek situation, the current equity declines are only 'somewhat interesting'. Even VIX 17s aren't anything for the bears to get overly hysterical about. Best guess... sp'2060/50s.. with VIX 20/21.. and then UP... after the July 4th weekend (and no.. that doesn't mean I am saying July 5th will open higher). Broadly... I still fear one further lunge higher into early August. 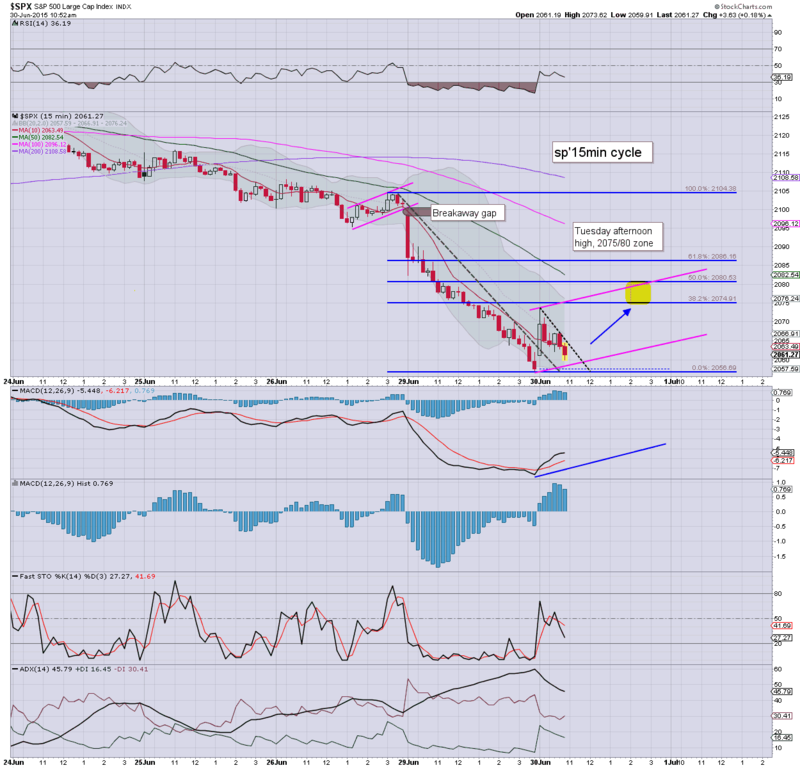 BAC -2.5%... still unable to clear key resistance of $18. 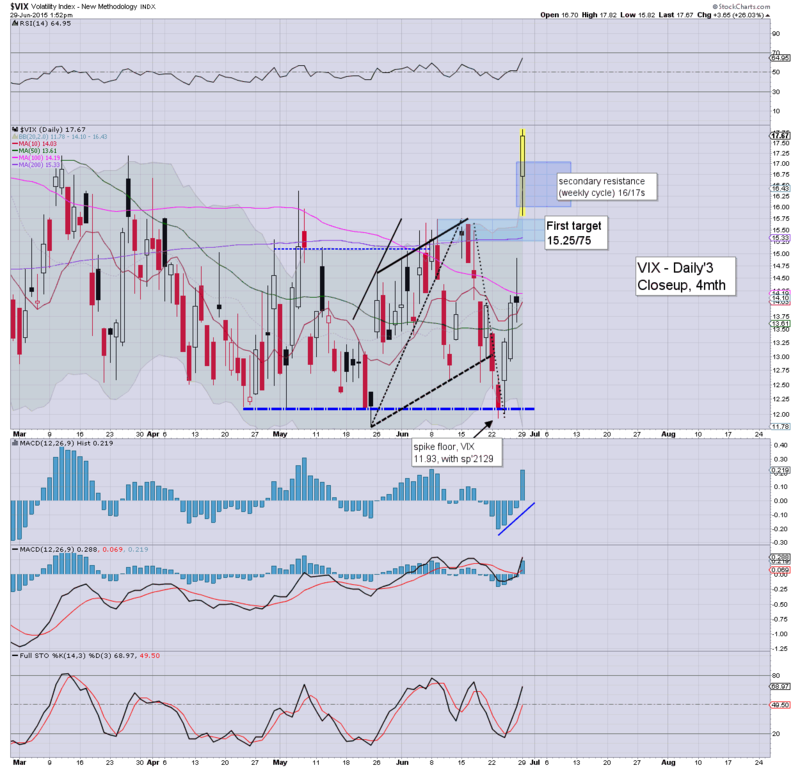 VIX update from Mr T. due. 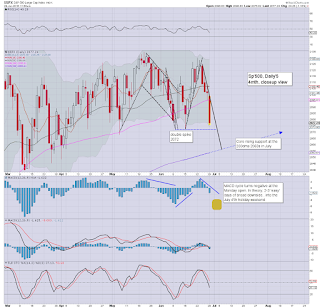 US equities remain weak, with threat of renewed downside on any sporadic 'spooky Greek news'. At best, equity bears should be able to briefly venture to the sp'2065/55 zone.. where there are multiple aspects of support. 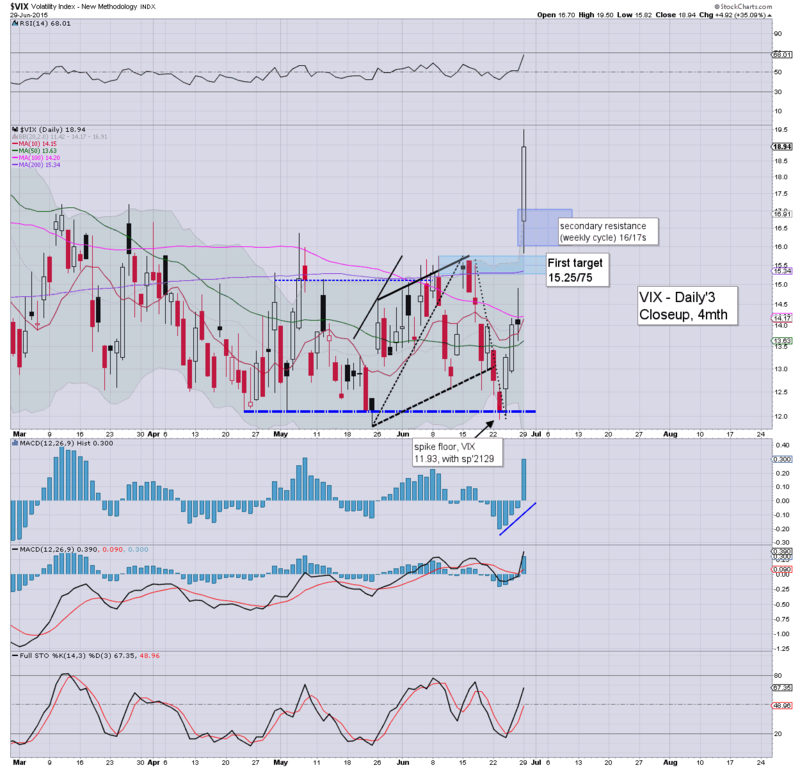 VIX is reflecting some concern, +19% in the 16.70s. It remains the case that a reasonable cycle low will be in the sp'2060/50s. Sustained action <2050 looks highly unlikely. *I am content on the sidelines. 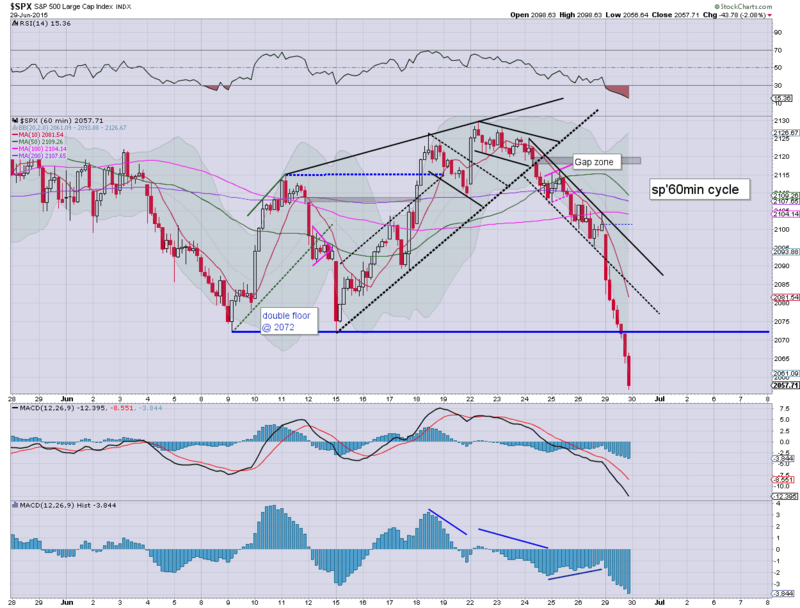 Right now, I'd actually consider LONG-oil, via USO... but not until equity indexes look floored. 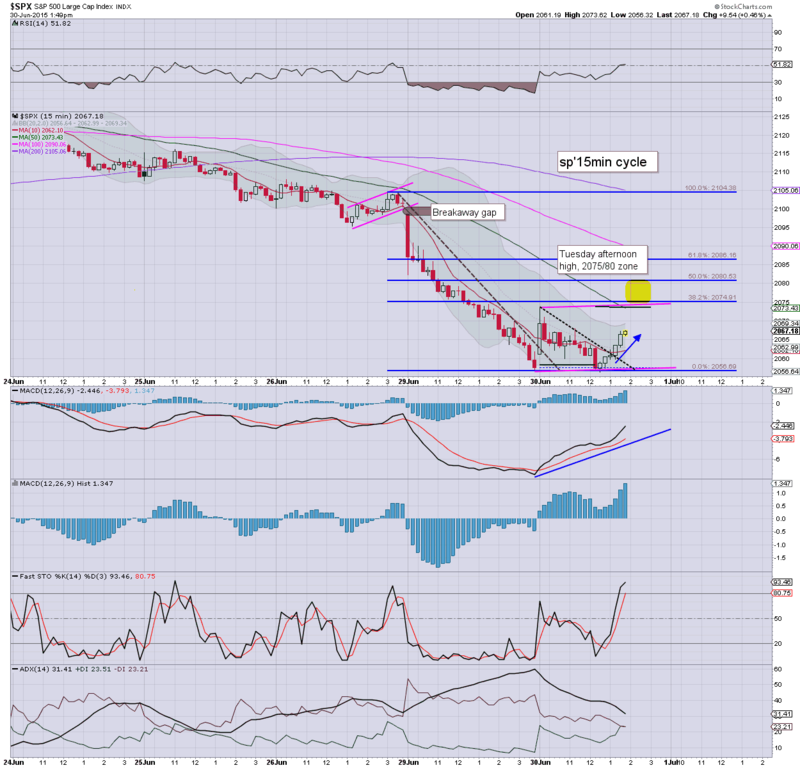 11.26am.. notable weakness, USD, -0.3% @ DXY 95.10s. 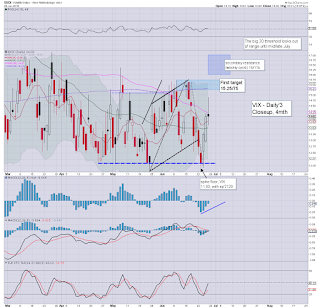 US equities open lower, but there is already a rather clear reversal underway, with a classic black-fail candle in the VIX.. having cooled from 16.82 to the 15s. USD is holding minor gains of 0.1% in the DXY 95.50s.. not least held down via central bank meddling. *I EXITED long-VIX at the open.. from the 16.40s. So.... we're off and running.. but for the bears.. the open is a disappointing one.. with a clear reversal.. as reflected most clearly in the VIX. 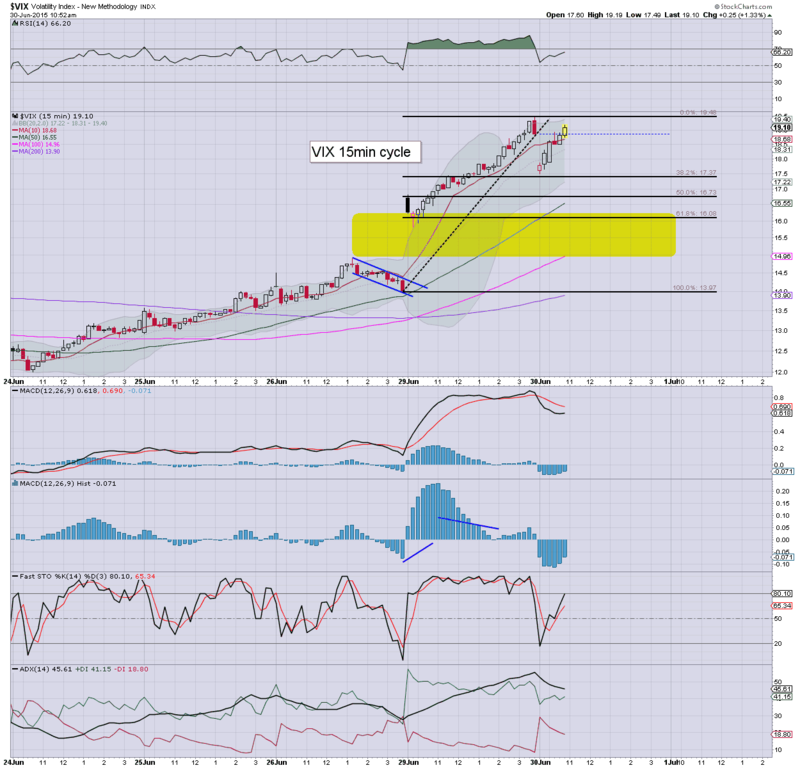 The bigger VIX weekly cycle had clear resistance in the 16/17s.. and we're clearly stuck. I am open to renewed equity weakness... but for this morning... bears should have probably already closed out. 10.05am. 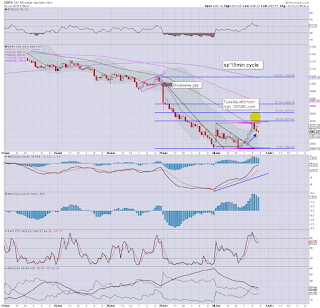 notable strength: CHK, +2.0% @ $11.30s.. with nat' gas +1.1%... still looks headed <$10 by late Sept.
Good morning. Equity futures are significantly lower, sp -22pts, we're set to open at 2079.. although that is a considerable way above the overnight low of -41pts @ 2060. USD is +0.2% in the DXY 95.60s. Metals are catching a fear bid, Gold +$5, whilst Oil is -2.5%. We have a very dynamic week ahead. Not surprisingly, futures have recovered half of last nights initial declines.. as some 'meddling' is going on from various central banks - not least the Swiss. The Greeks do not have the money to cover the payment to the IMF tomorrow. The ECB are currently (who knows if they'll change their mind).. said they will pull the bank liquidty program if a payment is missed. In theory, the Greek banking system will implode to zero as of midnight Tuesday. Primary target should be the 2060/50s.. where there are multiple aspects of support. Sustained action <2050 looks difficult in the current cycle. 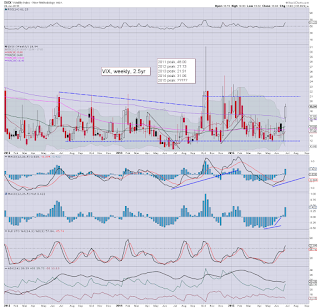 Eyes on the VIX.. which will be prone to getting stuck in the 16/17s. I do not expect the 20s in the current cycle. Bonds, TLT +2%.. as yields drop. Overnight Chinese action: more crazy swings... from +1.5%.. to -2%.. evens.. then (limit down) -10%... settling -3.3% @ 4053. The 3400s look on track. 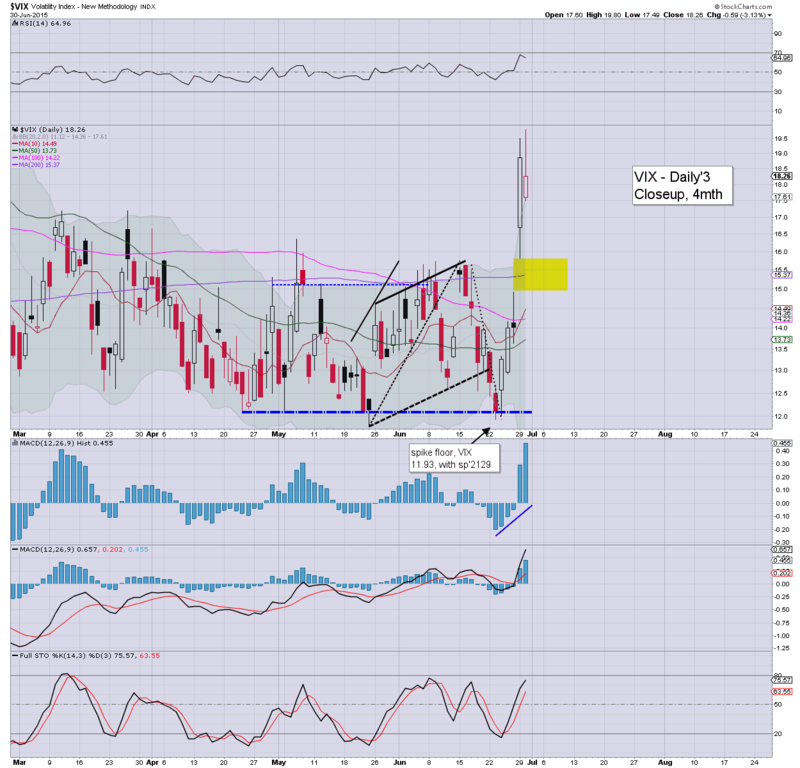 Well, I don't have an index short block, but I am long VIX.. which I will strongly consider dropping early this morning. 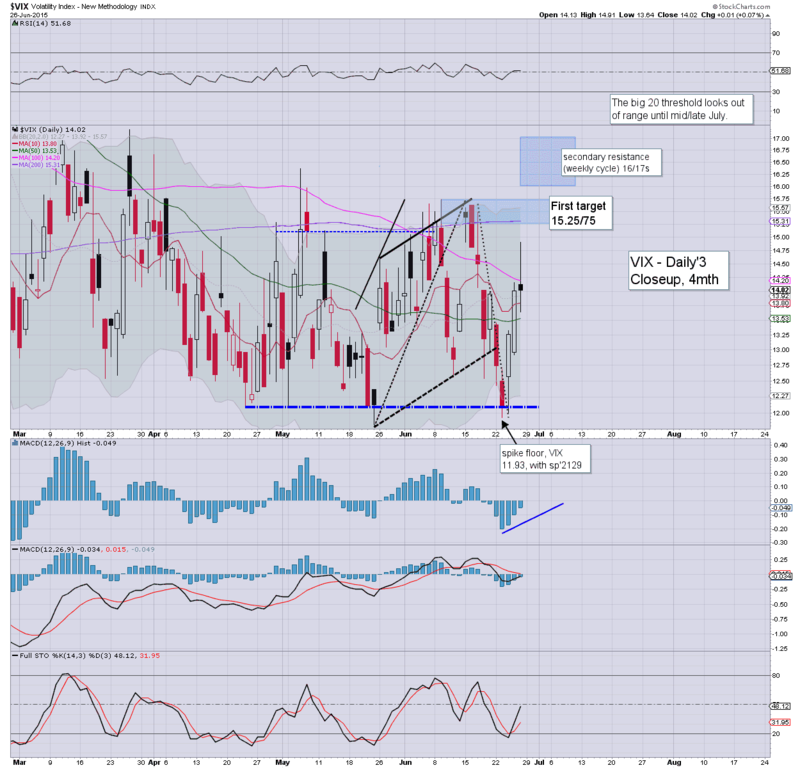 Depending on market mood/price action, I would consider a re-long VIX in the afternoon. I find it difficult to see the VIX going much above 16/17. notable weakness, NFLX -1.8% @ $640... a long down from the recent $706 high... headed for $600.. if not 525/500 by late Sept/Oct. 8.23am.. sp -20pts... 2081. Clearly... the recent double low of 2072 should be first target this morning.. along with VIX 16/17s. With unquestionable central bank meddling, the USD is u/c @ DXY 95.50s. 8.57am notable weakness.. GREK, -16%... trading.. despite the Greek market CLOSED. Crazy! sp -19pts.. 2082 for the open... I'd be surprised if we don't at least hit the low 2070s by 11am. 9.05am.. watching clown finance TV.. the Cramer is in full on denial again... not least about the broader implications for the other EU states. INTC -1.4% in the $30.60s... the H/S formation would suggest an initial bounce from 29.00s. 9.27am... sp -18pts.... on balance.. weakness into 11am... typically. Then upside into mid afternoon. 9.42am.. Reversal candles all over the place... esp' R2K.. . VIX - black-fail.. maxing @ 16.81.. right in target zone. US equity futures remain very weak, sp -29pts, we're set to open at 2072. 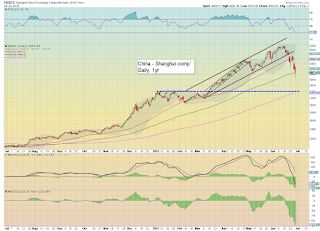 Across in Asia, the Japanese Nikkei is -400pts (-2.0%), whilst the Chinese Shanghai comp is seeing some strong swings, from +1.5%, to -2.0%... but currently flat. *commodities are mixed. 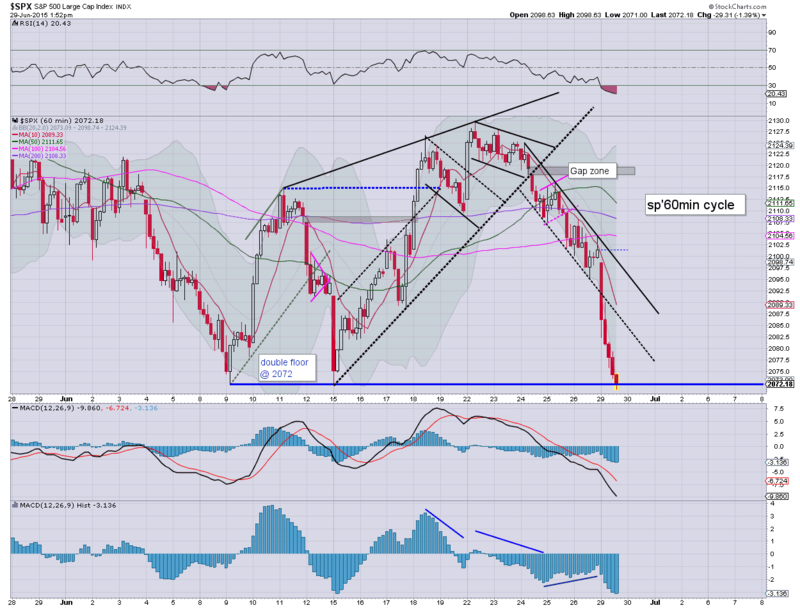 Gold +$7, whilst Oil -1.4%. Well, its getting kinda late.. and I'm starting to fade... unless there is a dramatic move one way or another in the next hour or two... I'm calling it a night. US equity futures remain significantly lower, sp -33pts @ 2068 (intra low -41pts @ 2060). Most notable recent headline... the Greek banking system will be shut until at least Mon' July 6th... after the referendum vote. Yet... once the ECB cut the bank liquidity program... any vote is effectively pointless. We're set to open with one of the biggest declines in recent years... but as ever.. the issue will be can such downside be sustained? I see a lot of talk about whether some 'help' will appear to fund the IMF payment due on Tuesday... but that seems extremely unlikely. The ECB have made it quite clear... if the IMF payment is missed, the bank liquidity program will be terminated. .. and if that program is ended... the entire Greek banking system will instantly implode to ZERO. US equity futures remain significantly lower, sp -34pts @ 2067 (intra low -41pts @ 2060). Asian markets are in the process of opening. 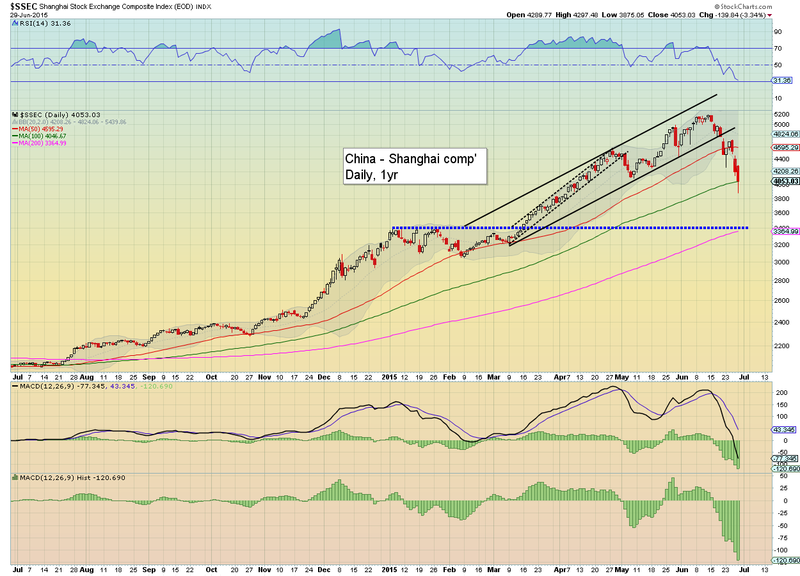 China looks vulnerable to falling <4K, despite a cut in rates and the bank reserve requirement. Sustained action under the lower weekly bol' - which will be around sp'2060 at the Monday open, will be difficult. Here is a major problem though for the bull maniacs. It is not like Greece are going to pay on Tuesday. Greek govt' state the banking system will be CLOSED until July 6th. NO BANKING until after the planned referendum! As things are.. I'm somewhat sceptical they'll even bother with the public vote, if the ECB do terminate the liquidity program. With no ECB help..... its game over.